Celebrate the launch of MeTV Hawaii this Thursday from 6-8 pm at Tiki's Grill & Bar in Waikiki! We'll have music from the Quadraphonix, live painting from Micah Perry, raffle prizes, drink specials and more. Plus 3 FREE hours of valet parking! So come down and help celebrate Hawaii's newest TV station! MeTV Hawaii is aiming for a retro-hip vibe that revisits what many consider Hawaii’s golden age of TV. The channel features classic TV shows from the ’50s, ’60s and ’70s, including “M*A*S*H,” “Cheers”, “Perry Mason,” “The Mary Tyler Moore Show,” “The Beverly Hillbillies,” “The Twilight Zone,” “Batman,” the original “Star Trek,” “The Brady Bunch” and more. During commercial breaks, they’ll be classic local vignettes, sourced from KITV’s archives. For a full schedule, visit kitv.com/MeTV or go to MeTVHawaii on Facebook. Guests at Thursday’s celebration, including KITV President Andrew Jackson and morning anchor Mahealani Richardson, enjoyed pupu and drinks, as well as a performance by the local funk and jazz band, Quadraphonix. Copyright © 2011 Nonstop Online, LLC. All Rights Reserved. 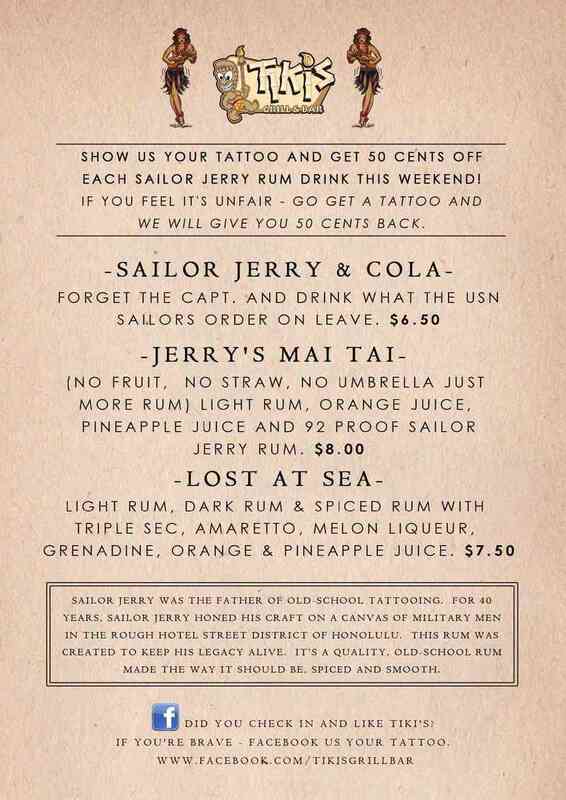 Sept 17 & 18th, 2011 -Show your tattoo at Tiki's Grill & Bar and get 50 cents off each Sailor Jerry Rum Drink this weekend. If you feel it's unfair - go get a tattoo and we will give you 50 cents back. 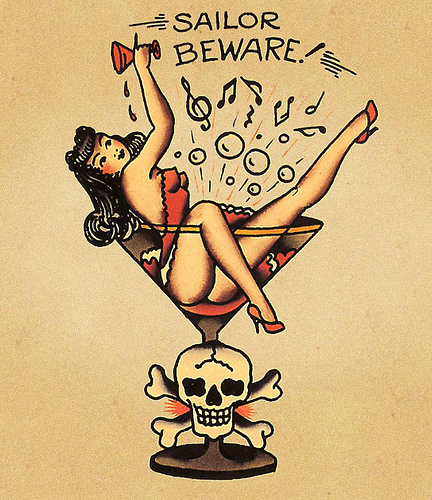 Sailor Jerry was the father of old-school tattooing. 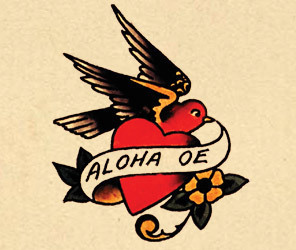 For 40 years, Sailor Jerry honed his craft on a canvas of military men in the rough Hotel Street district of Honolulu. This rum was created to keep his legacy alive. Nose: Intense vanilla, dry buttery toffee and subtle cinnamon notes. Taste: Warm spices of cinnamon & nutmeg with rich vanilla. 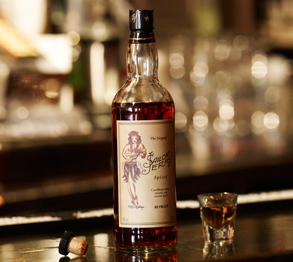 A long dry finish balanced with a subdued sweetness and a hint of burnt toffee Smoothness is the key to Sailor Jerry's versatility. Enjoy it how you like it — straight, mixed or in a cocktail. If you really want a true classic tattoo, you'll have to go back in time and cross the Pacific. When your tramp steamer hits the port of Honolulu, jump ashore and head straight to Chinatown. Soon, you'll hit Hotel Street. You'll know you're there by the sudden progression of wide-eyed sailors, foul-mouthed roughnecks, and general mayhem. And there, tucked away on a steamy side street, you'll see the bright red neon glow of "Sailor Jerry's"-the tattoo shop that put ink on the fighting men of the Pacific for nearly 40 years. Finishing his Naval stint in the late '20s, Collins decided to settle in the then "remote" island of Oahu, Hawaii. In some ways, his timing could not have been better (or worse, depending on who you ask!). This "last outpost" would soon become the stomping ground for over a million soldiers and sailors, all of whom were ready to live life to the fullest-usually contained within a 48-hour Honolulu shore leave. ©2011 Sailor Jerry Spiced Rum, 46% Alc./Vol. William Grant & Sons, New York, NY. Visit the Made in Hawaii Festival this year, and be sure to see Ronnie Nasuti, of Tiki's Grill & Bar, cook the following dish during a live cooking demonstration. Description: Palu Sami is a Samoan dish consisting of young luau leaves, coconut milk and onions baked or steamed until tender and custard-like. It sometimes has corned beef and can be eaten as a pupu or entree. Onion (½ inch dice)	¾ c.
1. Cut 4 squares of tin foil 12” square and lay them out. 2. Layer the leaves–large to small–5 pieces for each portion. 3. Bend foil into a bowl-like shape and fit luau leaves inside. 4. Divide diced onions into each luau foil bowl. 6. Fold two opposite foil corners over each other in the middle. Take the other two opposite corners and twist together like a Hershey’s Kiss bundle in the middle. 7. Bake for 1 hour and 15 minutes at 350 degrees F.
1. Add the tomatoes, shallots and saffron in a non-reactive, ovenproof pan or casserole dish. 2. Sprinkle with salt and pepper and barely submerge with virgin olive oil. 1. When the first two components are finished baking, remove from the oven and allow the Palu Sami to set. 2. Now grill your fish filets with a little bit of salt and pepper and some of the oil from the confit. 3. 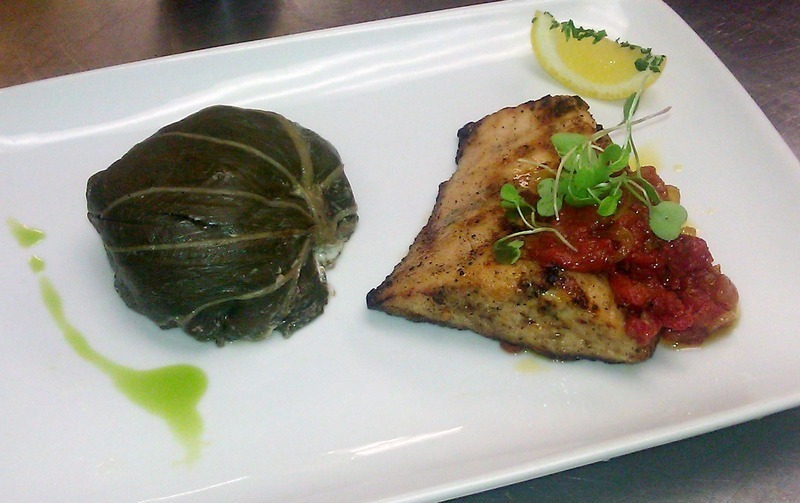 Unwrap Palu Sami and plate with fresh grilled fish and tomato confit. 4. Squeeze fresh lemon over fish and serve! A old friend stopped in to Tiki's Grill & Bar to film a new travel segment for a travel channel. Jon Olson the host is doing a new show called Next Stop TV. His creative team has earned seven Emmy nominations. NEXT STOP is a new TV travel show featuring the places and the people that make each destination unique. They will show you where to go, what to do and how to do it. Fun & positive entertainment is the theme of every show, featuring local music, sports & activities, local flavors and more. NEXT STOP gives you an insider’s look into each featured location. The Tiki's Grill & Bar segment will air locally NBC on August 27 and also be featured on the inflight entertainment for Alaska Airlines. Our good friends built this custom Bamboo Wedding Arch. It's avalible with advanced booking for wedding cememorys in the coconut club. Includes fabric drape but flowers are additional charge if needed. Fabric colors - pale pink, hot pink, white, green, yellow, blue or lavender. 50% deposit to place the arch on hold. 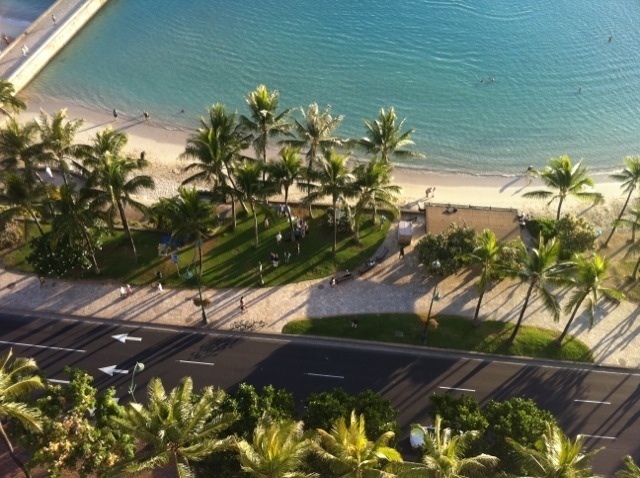 ocean views 21 floors above Waikiki Beach. Sonny Kapu group was the Hawaiian entertainment. shell blowing can be heard calling this special event to a start. Four (6 foot) tables were used to create the layout for this party. orchids, rope lighting were part of the extra decor package ordered. 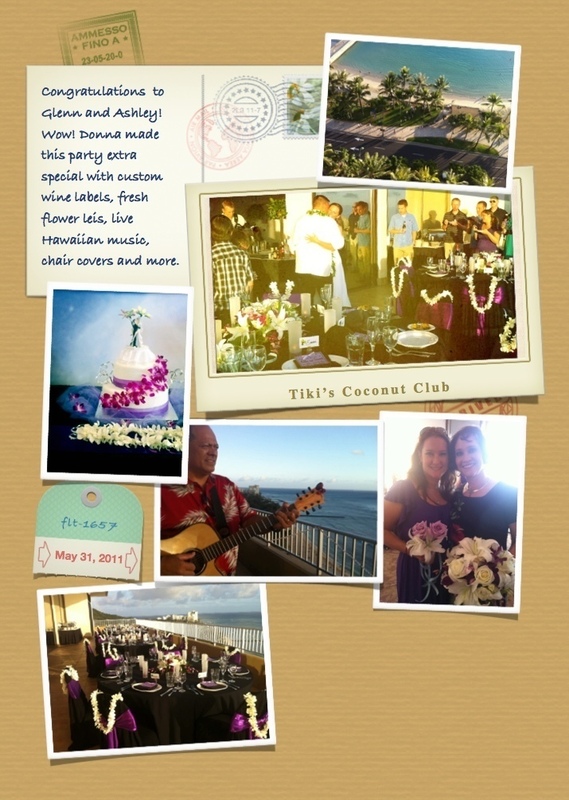 Mahalo note from a bride. Michael, Tiare & the Tiki's Event Team got this wonderful handwritten thank you note from Josh & Annalise. The Seattle couple had planed their dream destination wedding back in February. 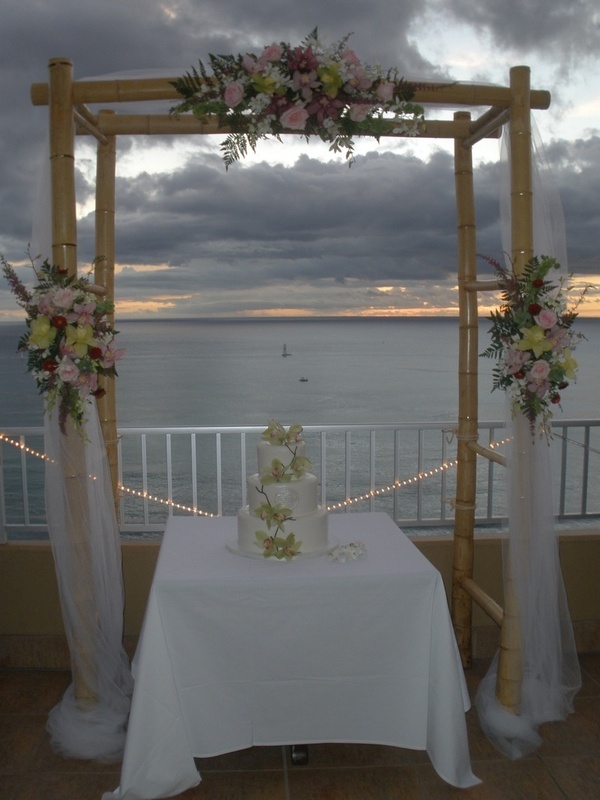 Having a intimate wedding reception of 25 guests, on the Ocean Room Lanai. For this setup we closed the Ocean Room lanai doors and build a long table, allowing space on the ocean side of the lanai for two high tops for cocktails and relaxing before sitting down for dinner. We set the base table with white linen and the bride bought in her own custom color table runner and napkins. Glass vases filled with sand and shell and a candle also decorated the wedding parties table. They choose these items from the Grand Tiki Buffet: Kohala Mountain Green Salad, Fried Rice, Mixed Steamed Vegetables, Mac Nut Crusted Mahimahi, Shrimp Penne Pasta and Guava Glazed BBQ Ribs. Hospitality is all about taking care of people.